Tales From the Known Lands..
Was the writing on the wall for Cragstrum? 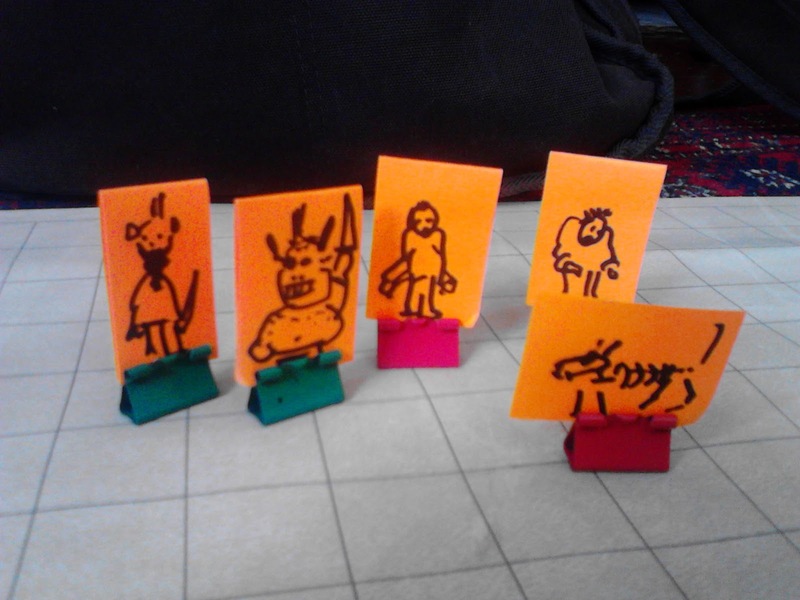 Astonishing as it may seem, five first level characters have all just survived their first push into a new dungeon! How is this possible? I don't know. Its never happened before. Sheer luck?, skill? dodgy character sheets? I think it was all down to the bulldog clip monsters and a black d6. Our new band of wastrels are resting up whilst trying to forget the sight of zombie flesh dripping from the walls and ceiling. Sweet dreams. Sweet exploding zombie dreams..
We finally finished the adventure Seobeq was running! Much has changed, much has stayed the same. The ever-present death around every corner stayed the same. There was such a good reaction to the session-recap-comic last time that I just had to do another one, and make it a bit fancier, so this one's longer and has a bit of colour on it too. The Moldvay Basic D&D colours of red and yellow, y'know. The very same colours used on the cover of the first printing of Labyrinth Lord from fun benefactor Goblinoid Games. Lets get out of here..
At long last Fortress of the Mountain King has been completed. More brave player characters perished. Only Wiffo the Cleric and Meriaboc the Halfling survived. Given the large amount of treasure they have accumulated, (not to mention the monsters inexpertly dispatched), those chaps are about to go up a level. The Mountain King Escaped and was last seen heading North. The fallen heroes now lie mouldering in a dung heap inhabited by an Okyuck. Our weary adventurers drag their battle worn bodies back to the village where toasted crumpets and guady waistcoats bring comfort to their sadened hearts. Will they continue adventuring?.................Of course they will!. Blimey, it's tough getting folks together for a game. But then again, it makes it all the more worthwhile when it happens.